In recent years, efforts have been made to expand the analytical features of the Highway Safety Information System (HSIS) by integrating Geographic Information System (GIS) capabilities. The original version of the GIS Safety Analysis Tools was released in 1999 and provided practitioners with programs to perform spot/intersection analysis, cluster analysis, strip analysis, sliding-scale evaluations, and corridor analysis. The updated version of this product has just been released and includes additional pedestrian and bicycle safety tools to select safe routes to schools, assess the bicycle compatibility of roadways, and define high pedestrian crash zones. One of the continuing goals of distributing the GIS Safety Analysis Tools is to encourage the safety engineers and others within the State and municipal departments of transportation and metropolitan planning organizations to explore the capabilities of the GIS-based highway safety analysis tools and to adapt those ideas and applications to fit their particular needs. However, due to the variety of implementations of GIS that exist within these organizations, developing capabilities in highway safety analysis requires an understanding of the requirements of GIS, linear referencing systems (LRS), and GIS-based highway safety analysis applications. The primary goal of this current effort was to discuss GIS/Safety integration in terms that can be understood by both safety engineers and GIS specialists, and to describe issues and solutions involved in the integration of GIS into safety-related analysis efforts. This task report is intended to serve as an educational document for both safety engineers and GIS professionals and to initiate a common dialogue. 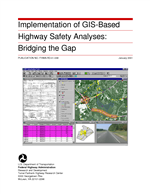 Hopefully, this report will begin to bridge the gap between the desire to implement GIS highway safety analysis within an organization and the development of a Geographic Information System - Transportation (GIS-T) infrastructure to support that effort.